Yesterday afternoon, my husband found an unwelcome visitor in our greenhouse. It wasn’t totally unexpected, as one of the nearby summerhouse owners had warned us the day before that they were getting them on their patio. Denmark is currently experiencing a severe drought. I don’t remember anymore how long it has been since we’ve had a decent rain. We had some showers a week ago, but it was probably sometime in June we last had a proper rain, if then. This isn’t normal for DK, not even in the summer. We’ve additionally add extremely high temperatures for the country, often getting up around 30C. Since I don’t live very far from the coast, our temperature is usually moderated a good bit by the sea air. The drought isn’t just killing off pastures and causing significant feed shortages for farmers. It’s causing huge problems for wildlife, who are also dehydrating. That’s why the snakes are moving in on people’s patios and gardens. They’re absolutely desperate for water and the only places to find it right now are where people are watering their gardens and plants. 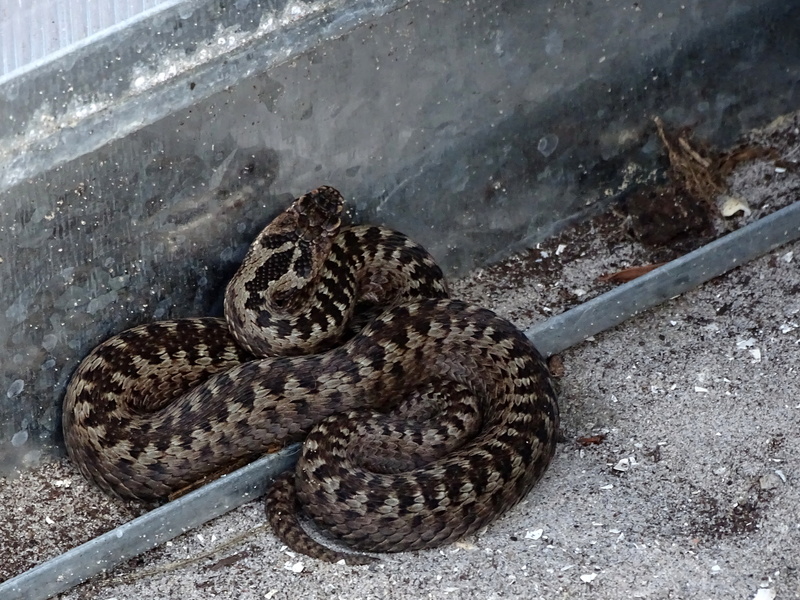 The Danish name for this snake is Hugorm, but the English name is Common European Viper or Common European Adder. It’s Vipera berus. But in reality, they’re not all that common here. They’re a protected species–we can’t just kill it for invading our garden. I’ve leaved here for twenty years. I know I’ve seen them dead a few times, but this is at most the second time I’ve seen one alive. I can’t remember for sure if the one we saw on a road the one time my parents visited many, many years ago was alive or dead. Usually you see them dead when they’ve been hit on the road and that’s about it. I’ve also seen a dead one in our horse pasture several years ago. One of the horses has been bit and we were able to confirm the cause because we found the body. We don’t know if the horse that got bit killed it or another one, but that was a spring when the snakes were just emerging from hibernation. The vet said the reason the swelling, etc., was so severe on that horse was because their venom was stronger when they’d just emerged. Luckily that isn’t the case now, but a snake this size would likely kill our puppy pretty quickly if she got bit and would make our two adult dogs at least very sick. Even adult humans are recommended to get medical attention and antivenom after a bite. I’ve always been fascinated by wildlife, but I must admit that poisonous snakes in my garden disturb me. I grew up in an area of the US where you pretty much didn’t see poisonous snakes, although you didn’t have to go too far away to be in Copperhead territory. I’m used to running around in the summer barefooted and bare legged. 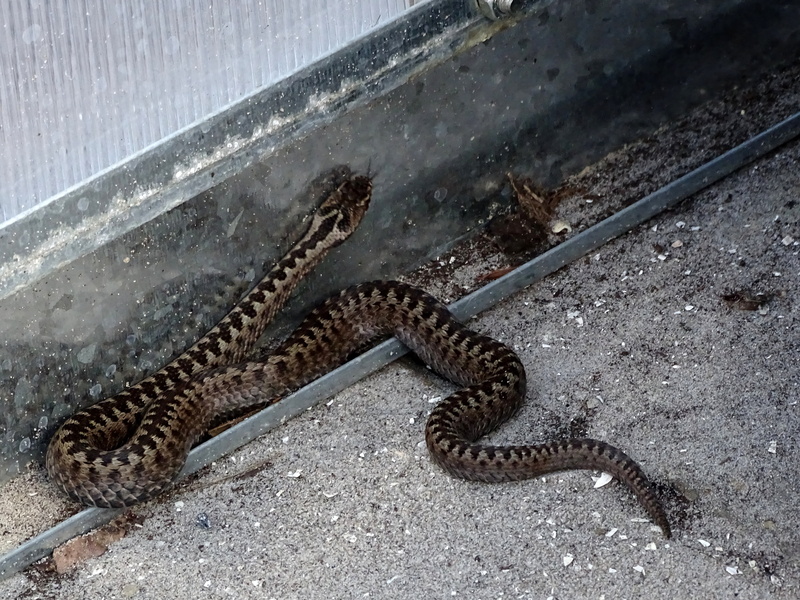 I’d been in the garden outside the greenhouse and even in the greenhouse itself not long before we spotted this snake. So right now I really hope for rain. Not just because our pastures are dead and our horses are getting hungry and I’m worrying about how big the food bill for them will be this winter with many people already having to supplement summer grazing with hay and feed. Not just because the entire country is in a burn ban and there is a severe risk of wildfires all over the area. But because rain would allow life to return to normal for these poisonous snakes. They could go back to avoiding areas of active human habitation and I could quit being scared to have the dogs in the garden and being nervous about my bare feet putting me more at risk. We don’t dare take the dogs to the beach right now. The path we’d use is right next to the largest stream in the area. It’ll be a magnet for all the snakes in the local dunes. People already advise caution swimming, because of the frequency of them in the sea. And people have suddenly realized they’re sharing their blankets and umbrellas with them on the beaches. I love my dogs too much to take that risk with their lives. The puppy doesn’t even weigh 11 kilos.